My kids love Jello. My son loves the fruity flavor and how it jiggles. They also love it when I make Jello squares. But I don’t like them to have so much sugar and artificial coloring. But did you know you can make your own gelatin squares with fruit? I found this technique in the book, The Tightwad Gazette. 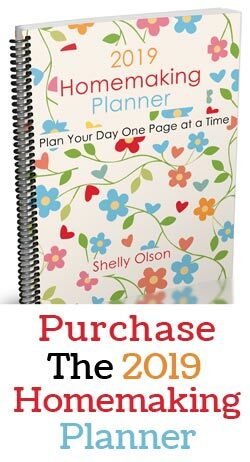 (affiliate link) It has so many great ideas for living on the cheap, if you don’t have this great book, check it out from the library or purchase a copy at Amazon. This time of year, I start to dream about all the great fresh berries I’m going to be picking soon. But that means I need to make sure to have room in the freezer for the berries. I found I still have a good supply of berries in the freezer from last year. Partly because I picked quite a few and partly because I found some great sales last year. So, I needed to find a way to use them in our menu plan. While pies, cobblers, and crisps are great to make, they also contain a lot of sugar and fat. 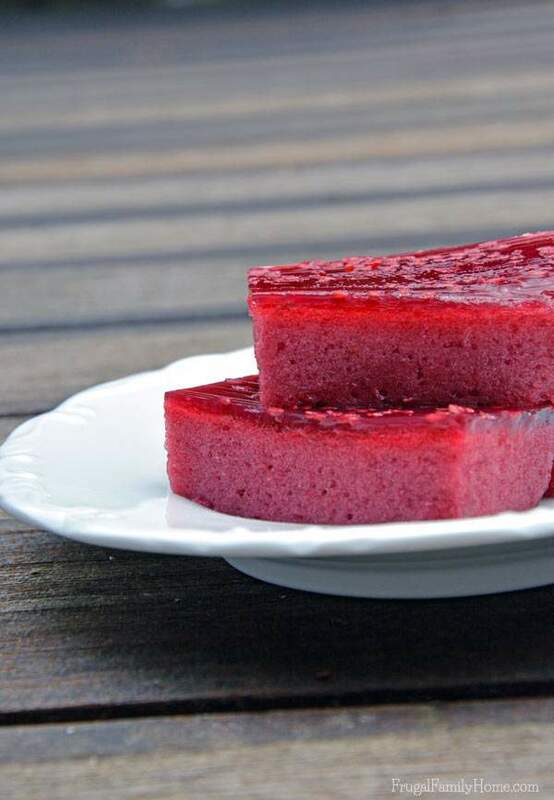 But gelatin is a great way to use berries with just a small amount of sugar. It is also pretty much fat free, so it’s figure friendly for me too. 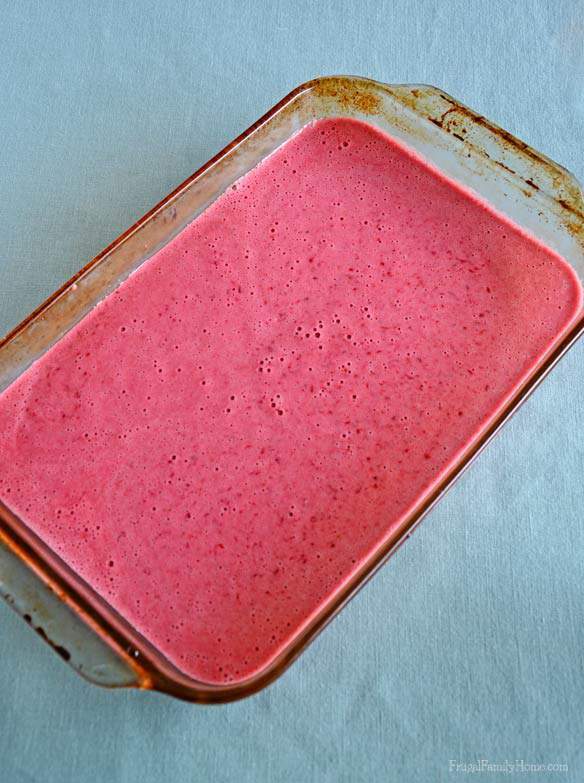 I make a blender gelatin with berries. Mainly because it’s so quick and easy to make. I start with some thawed berries, about a quart. Then I whirl them in the blender until they are pureed. Add a little sugar, I use about 1/4 to 1/2 cup. I added in 5 tablespoons of unflavored gelatin. (affiliate link) Be sure to look for it in bulk to save over all those little packets. The bulk gelatin is about half the price over the packets. Then just fill the blender with hot water, up to 5 cups, and blend again. Be careful, the mixture expanded while blending and it ended up trying to pop the top off my blender. So keep an eye on it. Then pour into a 9 by 13 inch pan and chill until cool and set. What you have in the end is a fluffy layer and a firm gelatin layer. If you like thicker gelatin squares, use a smaller pan. When ready to serve, just cut and serve. 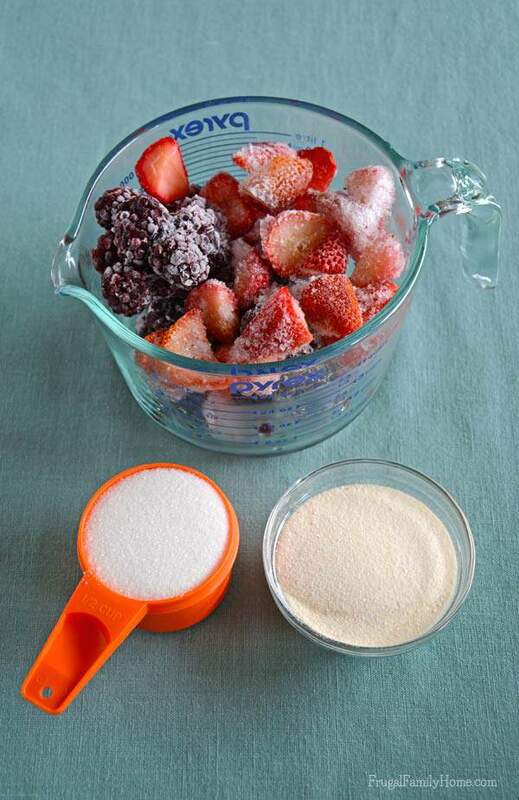 This is a yummy refreshing berry finger food no kid can resist. To make it even more fun, cut the gelatin into great shapes with small cookie cutters. 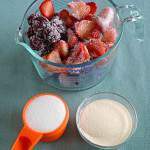 Blend the berries in a 5 cup blender until they are pureed. Add in the gelatin and sugar, blend again. Pour in the hot water to fill the blender to the 5 cup mark, blend until mixed well. Be careful it might try to pop the top off the blender so be sure to watch it close. Pour blended mixture into a 9 by 13 inch pan or a smaller square pan for thicker jello squares and chill until firm. Cut into squares or use cookie cutters to make interesting shapes. What’s your favorite flavor of jello? I don’t see why the maple syrup wouldn’t work. I’m sure it would work well. I’m hoping to try this with grapes and see how it turns out. 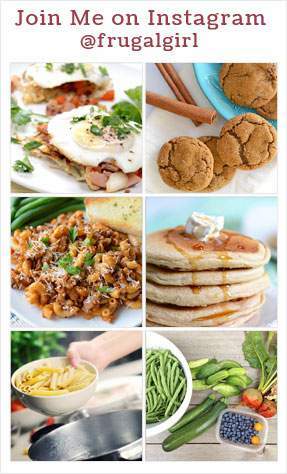 Yum, these look delicious! I think it would make a perfect summer snack…and so easy the kids could make it (with my supervision, of course). I also love that this snack doesn’t have any artificial colors or flavors too! My kids loved these. I know my kids could make them too, all except for mixing in the hot water as I almost had the top of the blender pop off. I’m hoping to give grapes a try next and see how they work. What a fabulous recipe Shelly! Not only is this easy to make, but I love the fact that it only has 1/2 cup of sugar! 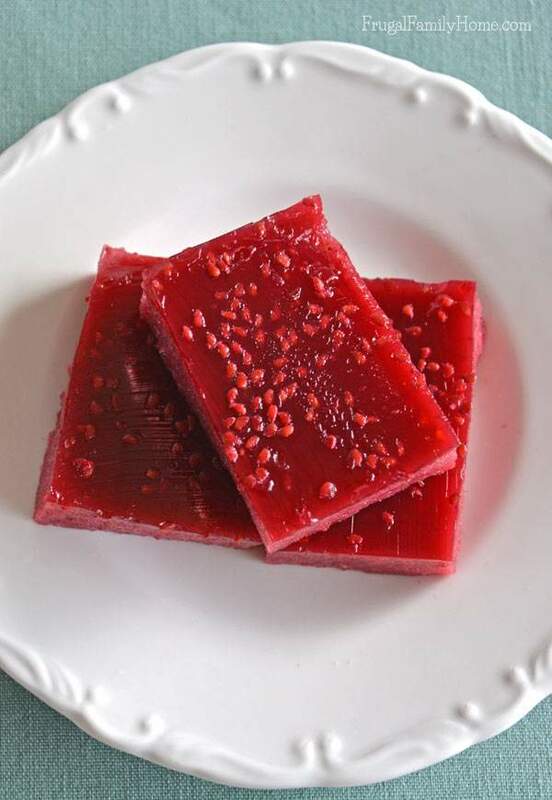 Can you use flavored jello instead of gelatin? How long before it sets? I usually make it in the morning and it sets by dinner time. About 6 hours or so, I hope that helps. This sounds wonderful! I’d like to try this with papaya, mango and coconut with a touch of honey. Will post back when I do! Lisa, that sounds like a delicious combination. Yum! I’d love to hear how it turns out. I haven’t made the papaya, mango and coconut dessert yet but I will let you know how it works out when I do. I did try the one you posted with a few tweaks! 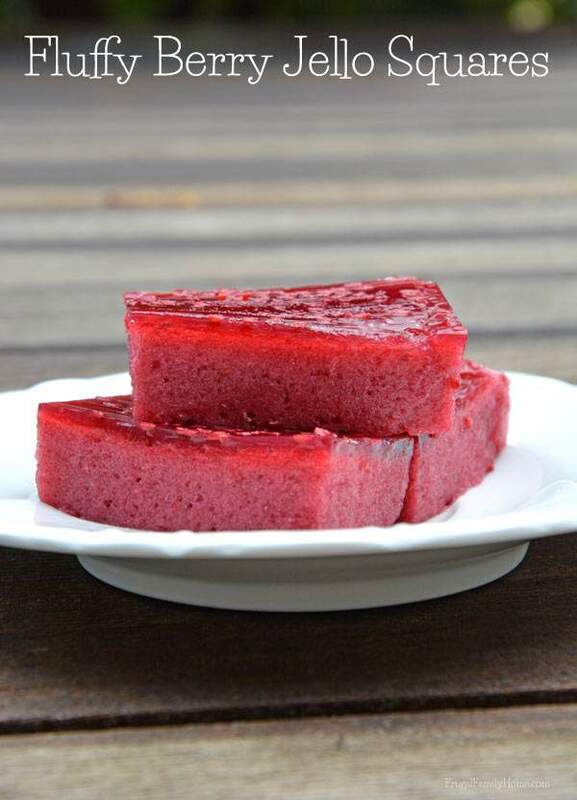 I used a box of lime jello, two cups of frozen fruit (blackberries and raspberries and one packet of Knox gelatin. I made the mistake of grinding the fruit in the blender with the lime jello instead of adding hot water to the gelatin first. It never set up. Tossed it. Second time I blended a cup of boiling water with a box of lime jello and two packets of Knox gelatin. I ground up two cups of frozen fruit with a cup of cold water and added that to the jello water after it was mixed. That set up fine but I should have added more sugar or honey. I have also considered adding cranberries to raspberry jello.